I first observed this meal when my American house-mate made some and was immediately taken in. Through a mixture of observing her and looking at some recipes on the net I gradually honed this to my tastes. Perhaps the biggest variable is the herb you use – I prefer sage but my housemate always used dill. Last time I made it I also added a Sweet Potato (par boiled then prepared the same way as the squash). 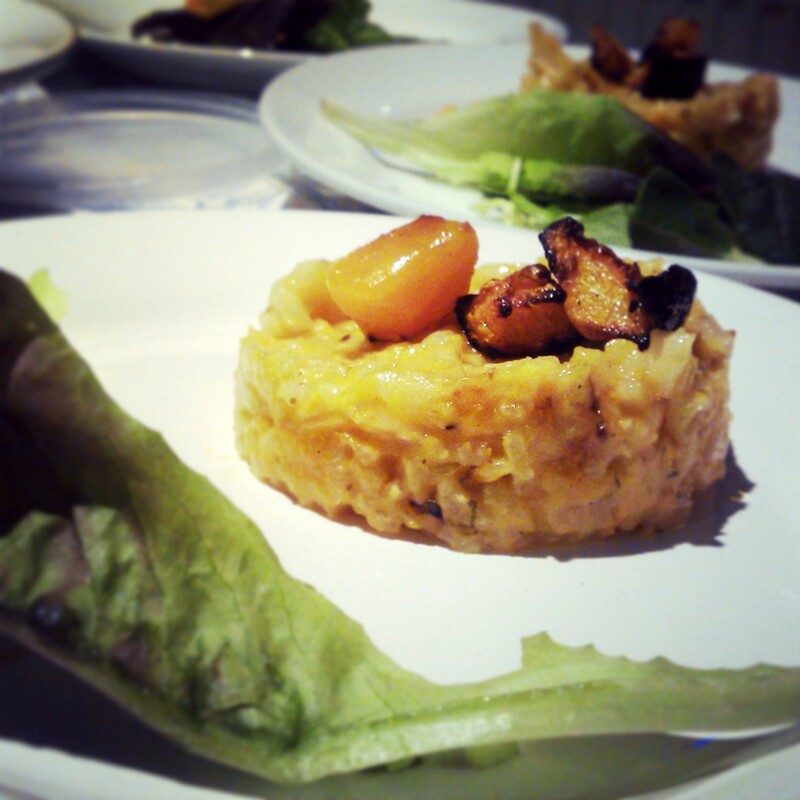 I think most root vegetables/squashes would work well for this dish so long as they can be made soft enough to mash. I used around 350g rice (dried weight). This made enough for about 6 decent portions using 1 squash and 1 Sweet Potato. Scale the rest of your ingredients around the amount of rice you use. Stock of any variety. Enough to cook the rice fully. Small vegetables – peas worked well. Prepare the Onion and Squash by peeling and chopping into chunks. The smaller the Squash the faster it will roast. If using potato par-boil at this stage so it can be roasted with the Squash. Toss the squash in a bowl with oil, seasoning and your herb until fully coated. Spread evenly on a baking tray and place in oven. You may need to turn them a bit during cooking. You know it’s ready when you can effortlessly mash a chunk with a spoon. While the Squash roasts melt the butter in a saucepan and fry the onions to your liking. Add the rice and coat every grain. Fry until turning translucent. Add the wine and stir gently until evaporated. Add the hot stock a little at a time – just enough to cover the rice. When evaporated, repeat this process. Continue adding and reducing until you have a thick, moist mixture. Try the rice to ensure it’s fully cooked. Don’t forget about the squash – it will probably be ready during this step. Put most of the squash into a bowl and mash to a pulp. 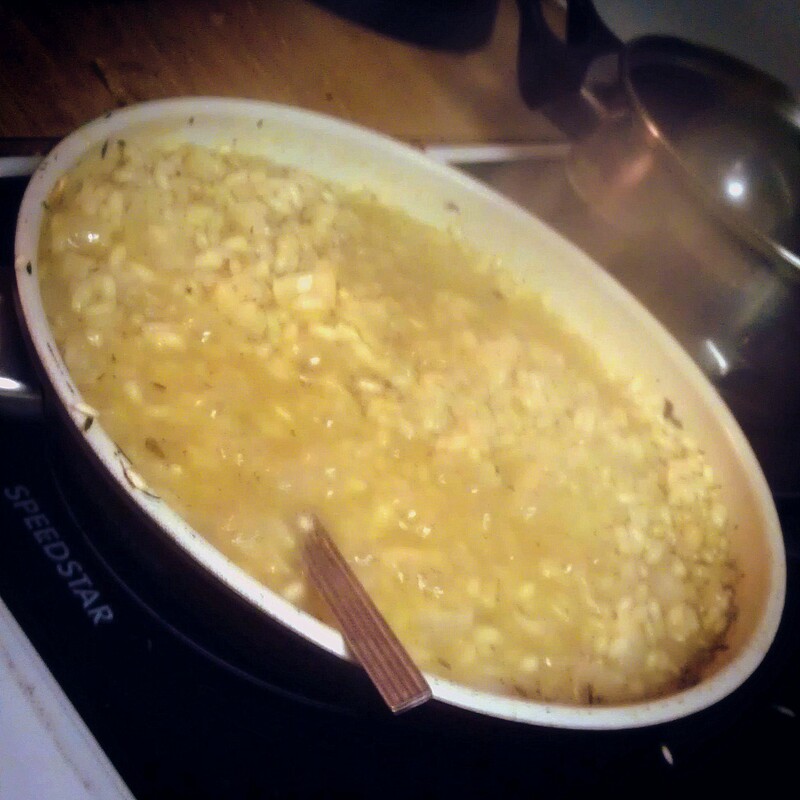 Stir the mashed mixture and grated cheese into the risotto until the taste and consistency are to your liking. If you don’t need to use it all, don’t worry – the mashed mixture makes a great side dish. Garnish with the remaining roast squash. Despite its heaviness, this works great as both a starter and main. For a starter, use a cookie cutter for shape and place on a small plate with a side salad. For a main, I suggest spreading evenly on a large plate although a bowl would keep it warmer for longer. Whilst best served on the night, I made enough to last me 5 days (although really, you should be weary of keeping rice more than 2 or 3). 2 minutes on medium heat in the microwave and it was wonderful. Whilst I’m not a fan of microwaves, a saucepan would run the risk of harming the consistency. If you have any questions or suggestions for alterations to this Guesscipe, please do comment! 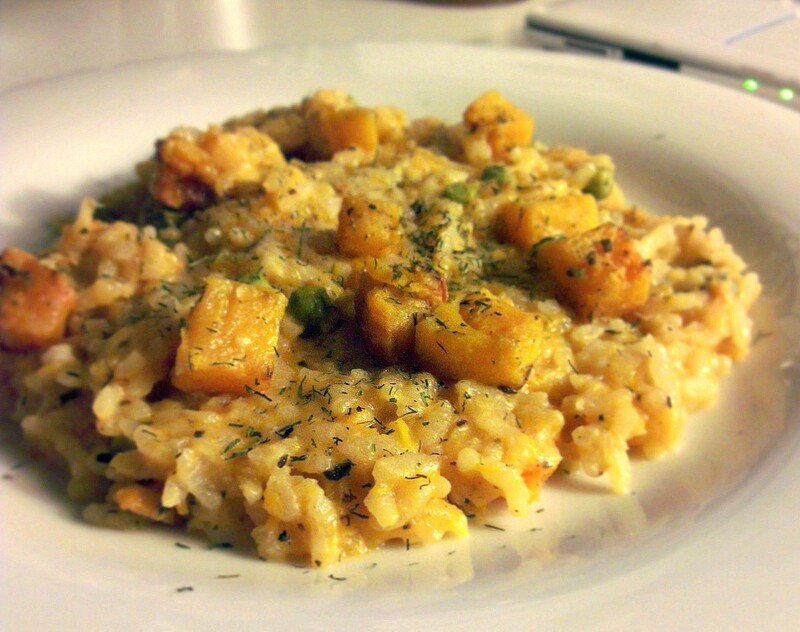 Posted in Guesscipes, Mains, VegetarianTagged Butternut Squash, Rice, VegetarianBookmark the permalink. I have made something similar and it is one of my favorite dishes! So warming and comforting. Glad you like it, I’d love to hear any differences your version might have had.